Use Google maps to find routes to and from the hotel. SEB'12 is organised by KES International and KTH Royal Institute of Technology, Sweden, and will take place in Stockholm, the capital of Sweden. Stockholm is one of the world's most beautiful capital cities, built on 14 islands connected by 57 bridges. The beautiful buildings, the greenery, the fresh air and proximity to water are characteristic of the city. Here is the world's first National City Park, Ecological Park, a green scenery is constantly present in the crush of the city. Visit Stockholm City Hall. Climb the City Hall tower for a stunning view of Stockholm. 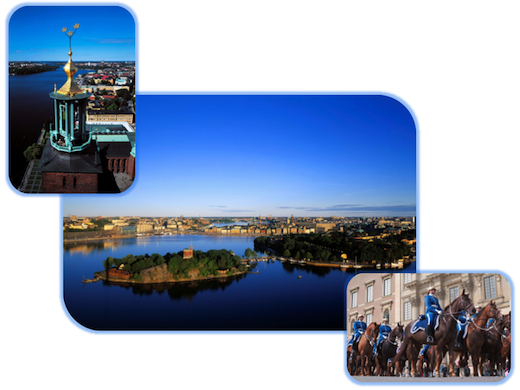 Stockholm, with its 750 years history and rich culture, offers a wide range of museums and sights in the world. Most attractions can be reached on foot and there is a good opportunity to experience a lot of these attractions during a short period of time. Experience city life, culture, history and nature, all in during only one day. The city is located in the middle-east of Sweden easily accessed by plane, train or bus. Arlanda, the International Airport, is located between Uppsala and Stockholm, and only 35km from Stockholm. From the airport, it is possible to travel by trains, buses and taxi. All, takes you to the central part of Stocholm.